Add “FLAVOR” to your event!! From a casual buffet to elegant, formal catering, food will enhance your event by satisifying your guests! Decide how comprehensive you would like your meal. How long will your guests be at your event? Will your guests be particularly active during your event, thereby working up an appetite? Is there a level of meal that is customary for your particular type of event (eg. formal meal for a wedding or snacks for a late-night party)? Is there a theme to your event that has a related cuisine (eg. Western, Hawaiian, etc)? Are there any special dietary requirements for your guests (eg. Kosher, vegetarian, etc.). Will it be particularly warm or cold during your event where the temperature of the food can contribute to the comfort of your guests (eg. soup for cold days or snow cones for warmer days)? What time of day will your event be taking place (eg. breakfast, brunch, lunch, or dinner)? These issues can help assist you in determining what menu items will be most appropriate for your event. Is your event formal or casual? The more formal an event, the more appropriate it is to use servers. Self-Serve Machines: The guests prepare food AND serve themselves. 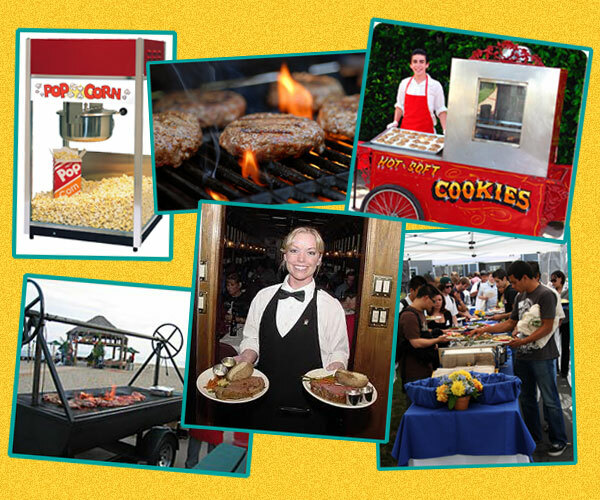 Food Carts and Buffet Style Catering: The food is prepared by our staff and the guests serve themselves. Full-Service Catering: The food is prepared and served by our staff. Our staff is ready to assist you in designing an amazing dining experience to make your event GREAT! !